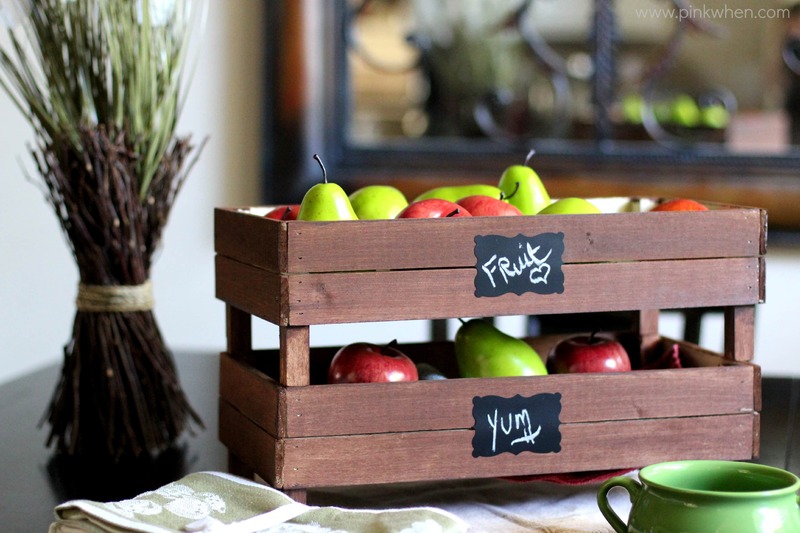 Today I am sharing with you these fun and easy DIY Stackable Slatted Fruit Crates. 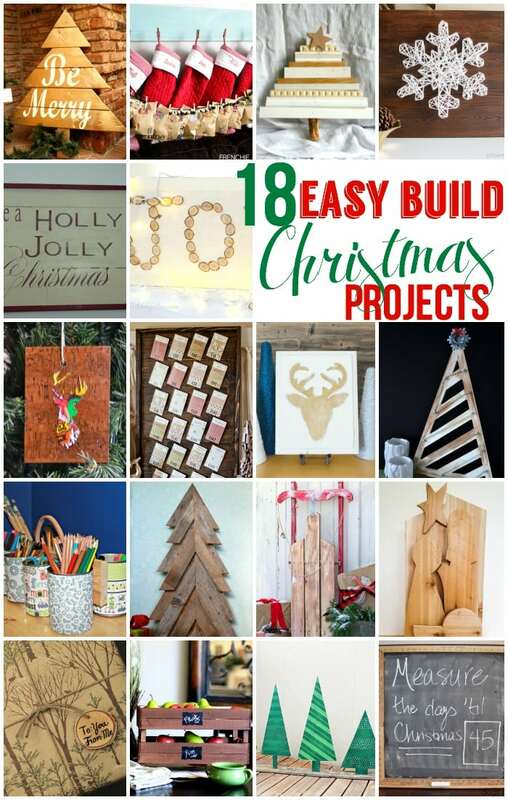 It is the perfect DIY Christmas Kitchen Decor present for anyone who loves that wooden rustic look. 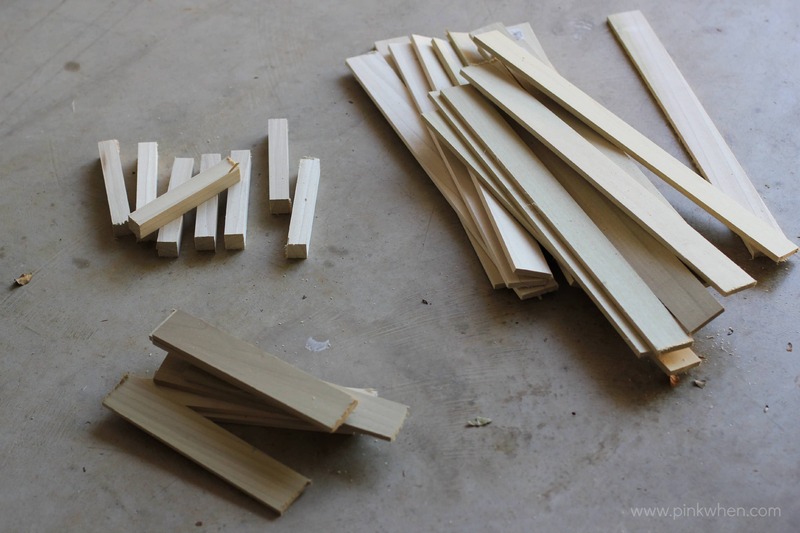 It can be hard to find wooden kitchen accessories, but these are easy to make. 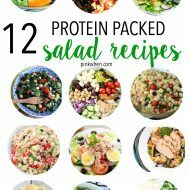 They are also great to store other things besides fruit. (Seriously, my toddler has one in her room right now and she is using it for a baby bed for one of her toys.) I love the chalkboard labels and the Walnut coloring. 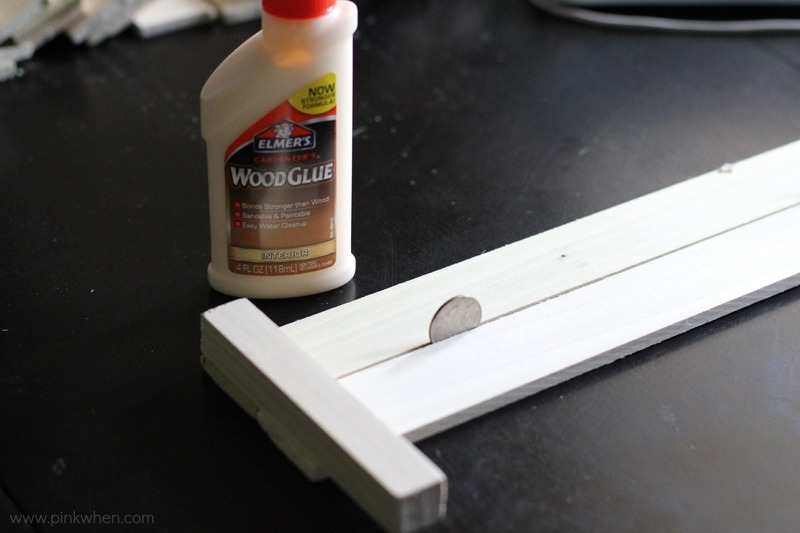 Check out how easy this project was to make. I love working in my kitchen, and I love shopping for decor. 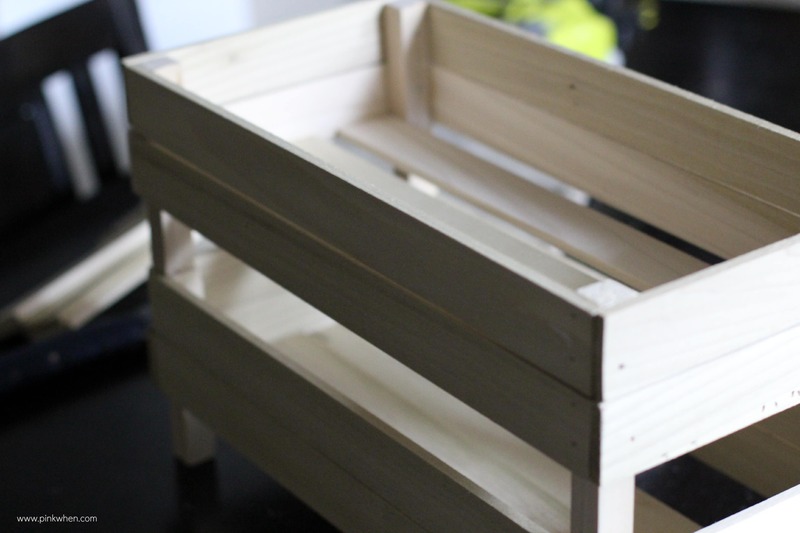 Sometimes you just find something you love and think to yourself, “I can make that!” When I found a similar group of crates online I wanted to make them. 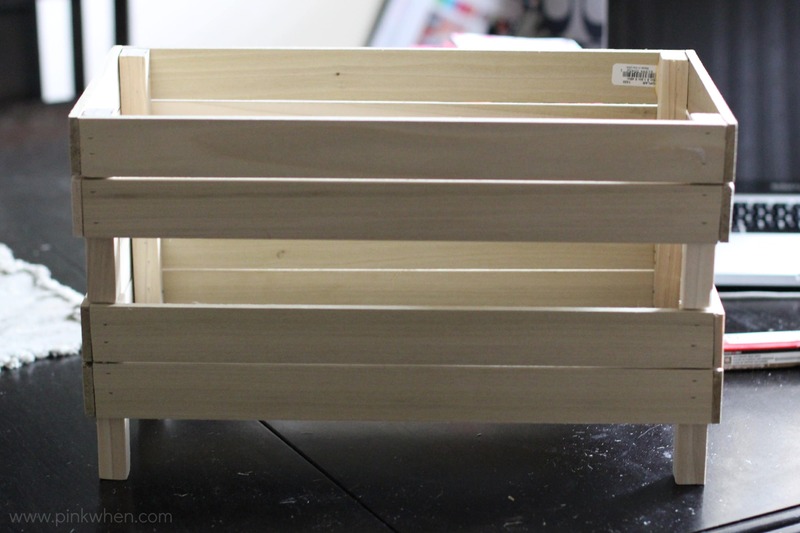 So today I am going to share with you exactly how I made these stackable slatted fruit crates and added some wooden accessories to my kitchen. 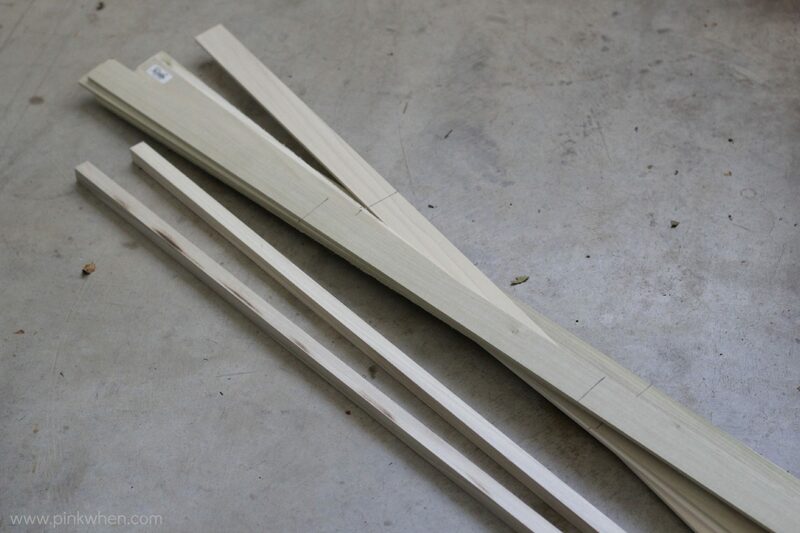 Once all of your cuts have been made take your sand paper and smooth all of the ends and edges out. Now it’s time to start putting this project together! 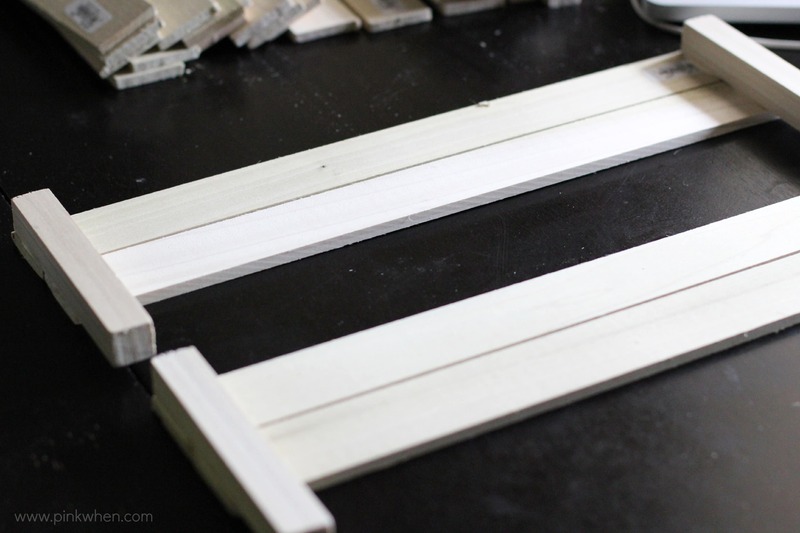 To create the slatted look and keep it uniform, I took two of my .25″ x 1.5″ x 16″ pieces and placed two quarters between them. This will give the slatted look I was wanting. 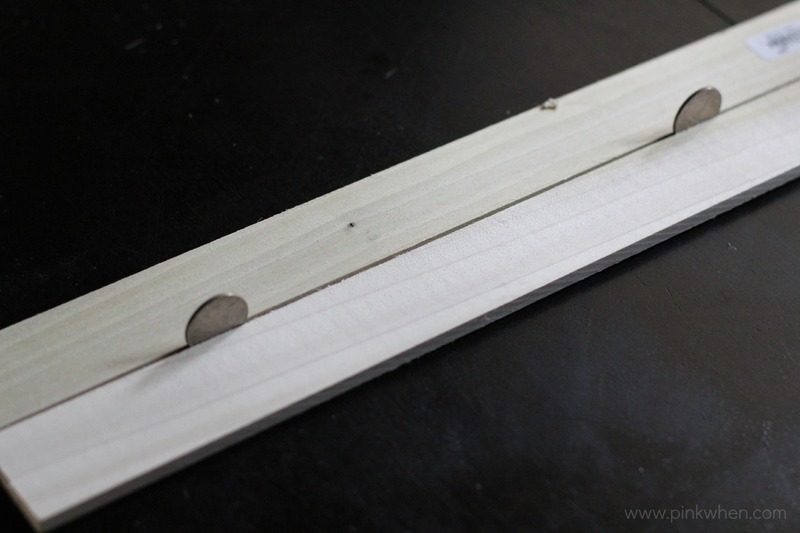 I then took the wood glue and placed a strip on the edges of those two pieces. 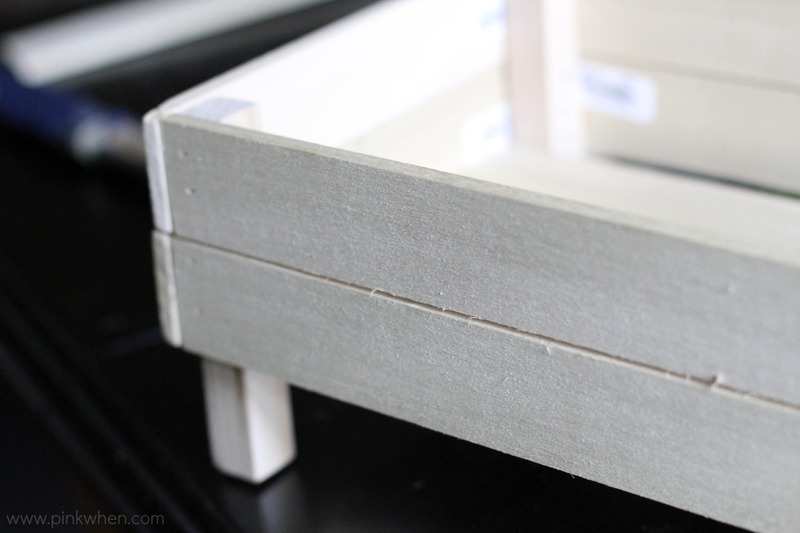 Once I had the glue on, I took the 3/4″ x 5″ dowel and placed it uniformly on the slatted pieces. Once dry, I was able to remove the quarters. In just a few short minutes your pieces should easily be secured. Once you have your front and back pieces, start adding on your sides and bottom pieces. Using the brad nailer really makes things go by fast. 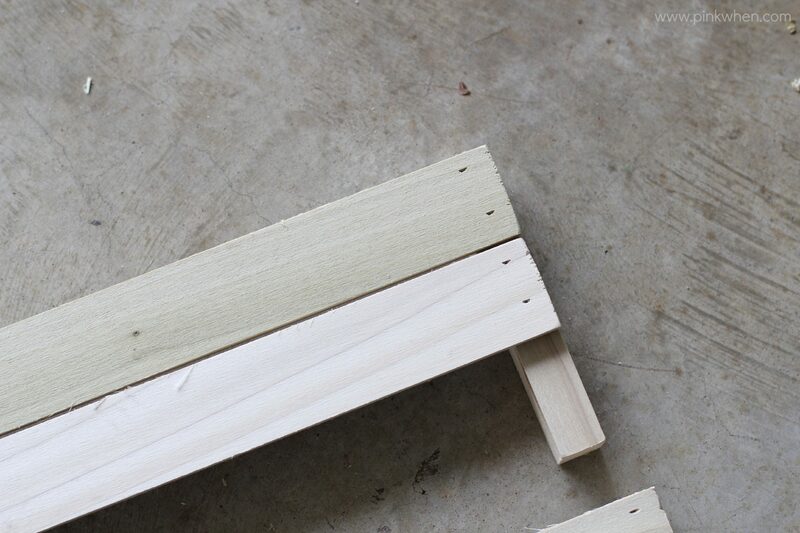 I placed the slatted pieces on the bottom a bit further apart. You could always notch the corners out where the dowels are and have them tight across the bottom, but if you are storing fruit and vegetables in the crates you are going to want the airflow to keep things fresh. You should quickly have a couple of stacking crates that look like this. I love the way the poplar looks without anything on it, but I decided to give it just a little color to wake things up a bit. I added a Walnut colored gel stain and some chalkboard labels to really give it a rustic look. I love these crates! You can separate the crates and add seasonal decor and place them throughout the house, or you can keep them in the kitchen and trend on with the wooden rustic look. 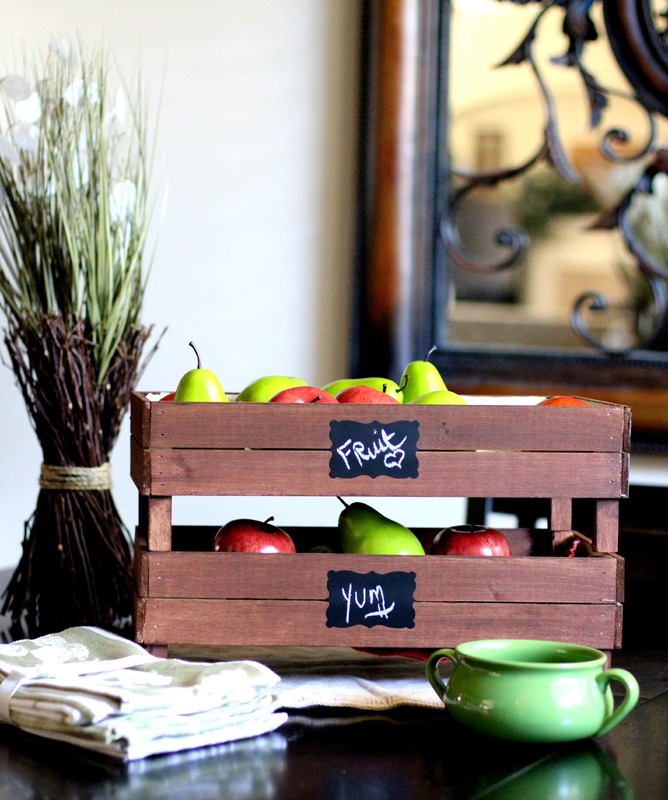 These DIY Stackable Slatted Fruit Crates are a quick project you can complete in a day and a perfect gift for friends, family, or to keep for yourself. 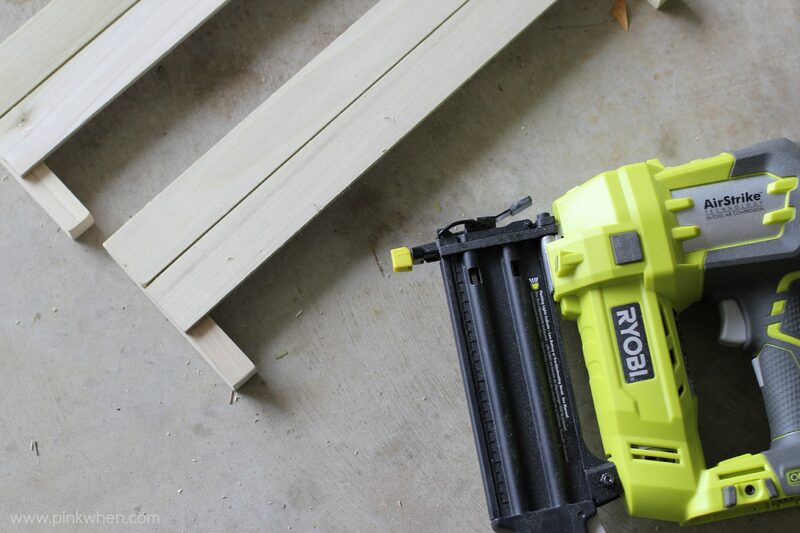 Check out all of these other awesome projects using Ryobi products! These are so cute, they could really be used for any type of storage! 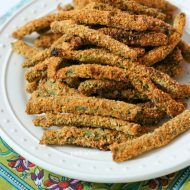 My mom would love these for a gift! I love that these stack. Great for organizing AND saving space! What a great idea! We are constantly in need of something like this on our messy counter/kitchen table. Such a great gift idea! I would love to have one of these. 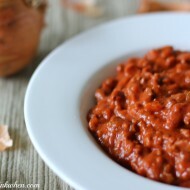 So easy to make and so many different uses. Great tutorial! Such a cute idea! I need a bunch of these!